Many Bachelor of International Business Administration students are motivated by the opportunities of doing trade between their own country and countries in Europe or Asia and this IBA specialisation is suited to those students who are intending to work in the field of cross boarder transactions, trade and transportation. Logistics and International Trade involves purchasing, materials management, inventory control, warehousing, transport and distribution. Logistics supports effective and efficient supply chain management by integrating the flow of materials and goods from the initial purchase of raw materials through to final delivery of a product to customers. Logistics and international trade students will be introduced to the supply chain, both in theory and in practice. Today, supply chain management is also concerned with the management of the return of goods or packaging to manufacturers as part of global awareness of the environment and conservation. This is known as reverse logistics and it is becoming increasingly relevant to business. The programme will prepare graduates with an understanding of logistics, supply chain management and general business; and knowledge, skills and attitudes to enable them to immediately contribute to organisational objectives at an entry level. Modules include Sales & Export, Supply Chain Management, Procurement & Production, Process Management, International Labour Relations, International Trade. Throughout the IBA programme in Logisitics & International Trade, you will learn advanced problem-solving skills, which you will be able to apply in different ways in a wide choice of future potential careers. Industry and the public service sector are looking for logistics people with a strong analytic background and with a potential to grow within the company into various managerial roles. This course is designed for international and local students who are interested in logistics, feel comfortable with mathematics, and want excellent job opportunities. In the logistics component, you will study the processes of planning, implementing, and controlling the efficient and effective flows of goods, services, and related information across supply chains. The management of these processes is crucial in meeting customer service goals, and is typically considered essential to a firm's competitive strategy. In the international trade component, you will study theories and practices in the economic and trade conditions in the wider global context within which these operate, as well as aspects of business communication such as marketing and management in the international and intercultural context. We focus on the anglophone trade and business world, so there is also an emphasis on the English language required to operate in the international context. You will also learn about the relationships between organisations, the business environment, culture and society. Logistics is the management of the flow of resources between the point of origin and the point of destination in order to meet some requirements, for example of customers or corporations. The resources managed in logistics can include physical items such as food, materials, equipment, liquids, and staff as well as abstract items such as information, particles, and energy. The logistics of physical items usually involves the integration of information flow, material handling, production, packaging, inventory, transportation, warehousing, and often security. The complexity of logistics can be modeled, analyzed, visualized, and optimized by dedicated simulation software. Minimizing use of resources and time are common goals. International trade is the exchange of capital, goods, and services across international borders or territories. In most countries, such trade represents a significant share of gross domestic product (GDP). While international trade has been present throughout much of history (see Silk Road, Amber Road), its economic, social, and political importance has been on the rise in recent centuries. Industrialization, advanced transportation, globalization, multinational corporations, and outsourcing are all having a major impact on the international trade system. Increasing international trade is crucial to the continuance of globalization. Without international trade, nations would be limited to the goods and services produced within their own borders. English is increasingly the language of international business and trade. The combination of subject knowledge and good English language skills students develop on the IBA programme will give you a distinct advantage in the international job market, either in the Netherlands or world-wide. There are many jobs available for you in business, trade, public service, finance, marketing, management, retailing and the leisure industry. Some of our most successful graduates have even started their own businesses and many go on to postgraduate study, either here at Wittenborg or elsewhere. Students with successful study experience equivalent to 160 European Credits in a related business or economic field are able to enter directly into the Final year programme (80 credits). The examination and graduation board will decide on entry based on credit transcripts and qualifications presented. IELTS 6 or TOEFL Equivalent. Click here for an overview of the equivalent scores. TOEFL Code of Wittenborg is 4889. Not got the English level requirements? Inform about our Foundation Programme here. 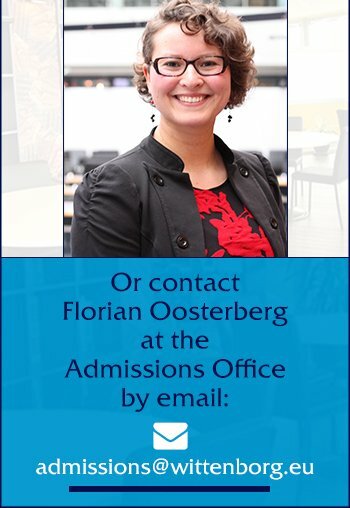 To gain quick contact with our admissions team, why not pick up the phone and call our office number (+31) (0)88 667 266 or our mobile phone number +31 (0)628364624, and speak to Ms Florian Oosterberg, our Senior Admissions Officer or Mr Santosh Aryal, our Student Registrar. If you would like us to call you back, we will!